In part one we had a brief introduction to the man himself followed by a look at just a few of the many toys that carried his name. 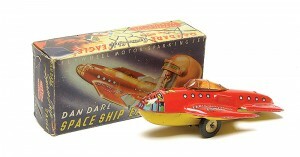 We carry on here with a follow up identifying yet more Dan Dare toys. 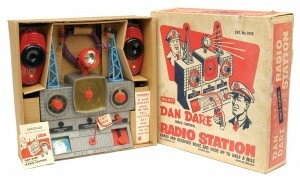 Electronic space control radio station – an officially licensed product by J & L Randall Ltd. Complete with twin blue plastic aerials, revolving searchlight, space telebuzzer (morse code tapper), message pad & two way wakie-talkie. Made in England by Merit. Boxed 35cm x 35cm x 10cm. Relatively easy to find item but much harder to find in complete condition. 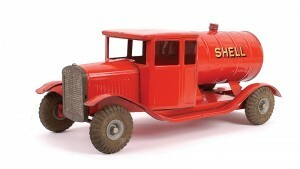 Plastic in its construction, officially licensed product by J & L Randall. Gun came in various colours with 3 shockproof plastic spinning missiles ( note shockproof but not childproof ). Made in England by Merit. Boxed 17.5cm x 27.5cm x 5cm. 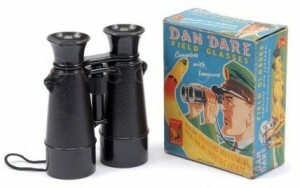 Relatively easy to find, harder to find with all missiles complete and undamaged. An officially licesed ‘Presso’ book by Wallis Rigby. 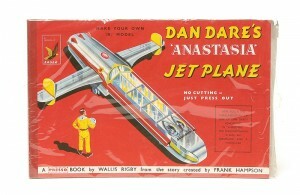 Basically a large card model making kit of Dan Dare’s jet plane, no scissors required as the model was pre-cut ready to be pressed out. Finished model is some 46cm. Relatively hard to find in its intact state. Officially licensed product by J & L Randall. Grey or copper coloured spring loaded plastic gun complete with 2 red plastic safety rockets. Rockets fitted with rubber end caps which when removed reveals a secret message chamber. Hard to find boxed and complete, rare in copper colour. 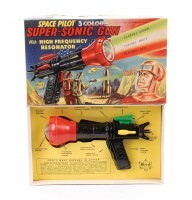 Battery operated multi-coloured plastic ray gun. 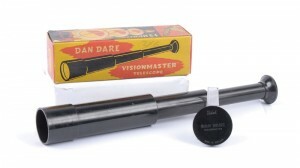 Can operate as a torch with switchable 3 coloured – red, white or green lens. Intermitant light (morse code) signalling and high frequency resonator (buzzer), all trigger operated. Gun measures some 22cm. Made in England by Merit. Hard to find complete and boxed. 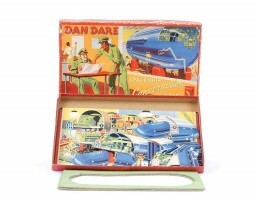 A Dan Dare Construction Game produced in the 1950′s by Chad Valley Toys. Licensed by Eagle Comic by permission Hulton Press. 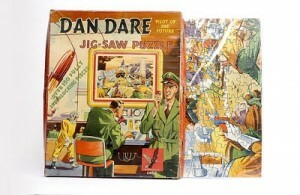 For more Dan Dare merchandise please see my original Dan Dare Pilot of the Future post and also Dan Dare toys part 3 & part 4.